315Mhz receiver - four pins? 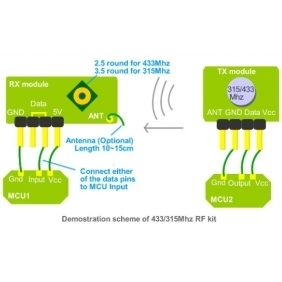 > 315Mhz receiver - four pins? I can't remember where I got them and I can't find anywhere that says what the pins are on the receiver (the transmitter pins are labelled). All the tutorials about these things have more pins on the receiver. Any ideas on what the pins are likely to be (and if I'm likely to break it by putting the 5v on the wrong pin)? EDIT: Never mind, it's in one of the pictures on the link above. Rather than deleting this I'll leave it here in case anyone's googling for the same thing later. It's GND, Dat1, Dat2 and Vcc starting from the nearest edge. Re: 315Mhz receiver - four pins? Isn't one of those pins the Antenna in? Don't know. I've got it working using dat1 and the built-in antenna. but i don't understand if pin near the corner is Vcc or GND. Thank you!